FBTBForums.net :: View topic - Who is this Jedi? Posted: Tue Sep 30, 2008 3:13 am Post subject: Who is this Jedi? I was doing my usual news check on rebelscum.com, and I stumbled upon this picture, and went towards the big round headed Jedi dude. I have never seen this character before, nor have I heard of the species he belongs to. He may not have the looks, but he certainly looks like he can fight-- a lightsaber and a blaster. Best of both worlds in my opinion. Wioslea's always been that ugly. I think they're from the "outer" rim territories. If you can't beat 'em, kill their leader! 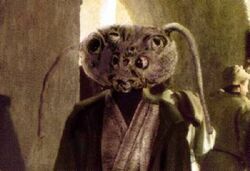 I have seen this jedi before, it feels like someone was like ok she needs a lot of eyes. What bothers me is that the eyes seem oddly placed and there is no symetry of her head. It also looks weird compaired to the body, in my opinion it would have been better if the body was larger. Because a head like that would be one heck of a strain on your neck. Hey just because I didn't finish my sentence dosn't make me lazy. I just don't like working.